I want you (yes whoever is reading this) to stop for a second and remind yourself when you first started reading comics. You might read something that started off as mundane but then gave you a feeling that only comic books can deliver. It may be a trip across the multiverse, a trip to the past or the future, or a battle against some cosmic God you will always will remember the first a comic book took you on an adventure you’ll never forget. Keep that in mind, also as per usual there will be spoilers! you have been warned! Normally I save the art for the very end but given the theme of this issue I wanted to discuss the art first. Since this arc appears to be focusing on Jessica going through the GLC boot camp, I loved how Ronan Cliquet made each panel featuring Jessica had a grandiose feeling to it. 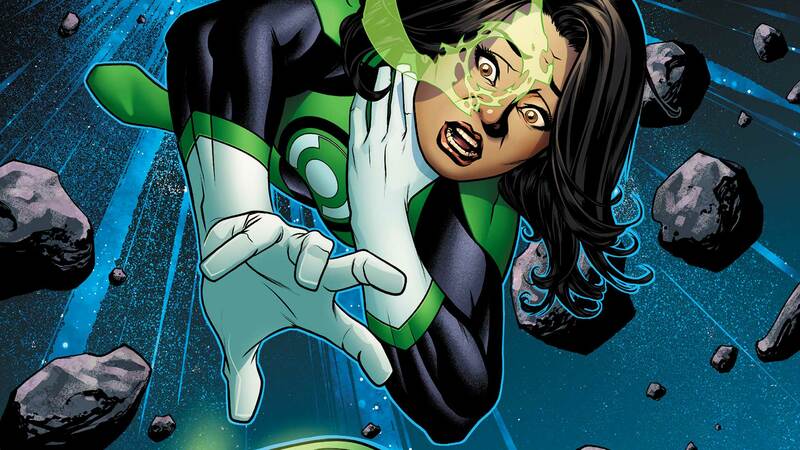 We as the reader were experiencing the thrill of her first flight into space and meeting other Green Lanterns. Honestly it reminded me why I love Green Lantern so much, it’s the fact that they are bigger than most earth based heroes. Also seeing Jessica’ go through various emotions were conveyed perfectly, it kinda reminds me of when I traveled to my first con years ago. Minor art complaint in one panel we can see Natu flying off and for some reason she has two Sinestro Corps symbols on her chest, honestly don’t know why Cliquet would have done that but it just a nitpick. I know that I’ve complained about how Simon doesn’t receive equal treatment in comparison to Jessica when it comes to character development. In this particular instance, putting the focus on her is actually really smart. Pairing her up with Kyle was a nice touch from Humphries as both lanterns were given their rings under unusual circumstances. With the exception of Kyle (who felt like the lovable character that we all know and love), everyone else felt a bit more over the top than per usual. I can understand Kilowog since he still drill instructor personality is already flamboyent, or it could be that since this issue is mainly from Jessica’s POV so that would explain why everything is a bit more exaggerated. The issue only slowed down was Volthoom’s disguised meeting with Ganthet and Sayd, there is nothing inherently wrong with this scene but I was enjoying Jessica absorbing the new world around her that the pacing for the issue slowed down for me. Although it’s a bit hard for me to believe that Ganthet nor Sayd didn’t sense anything weird with Rami, it’s almost to perfect because the plot demands that Rami isn’t detected, instead of simple exposition there could have been a slight struggle for Rami/Volthoom to be welcomed. For the start of a new arc, this issue reminded me why the Green Lantern Corps is such a unique aspect. Even though most of this issue was mostly Jessica’s reaction to the new world she’s just been introduced to. Overall an enjoyable issue and fun start to a new arc.